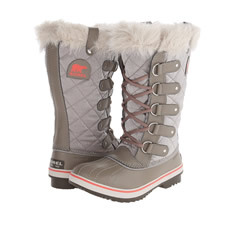 Sorel Boots are probably the most popular type of winter boot in Montana. And this is not by accident. Sorel’s are legendary for their durability. It is common for a pair of Sorel Caribou Boots to last for 10 years or more, despite heavy daily use. And many of their styles can have their life further extended by putting in new boot liners. Moreover, Sorel boots are exceptionally warm. The temperature ratings on Sorel's range from 0 degrees down to a rather frigid -100 degrees. Because of the extreme warmth that Sorel’s provide, they are very popular among people who work outdoors during the winter months. 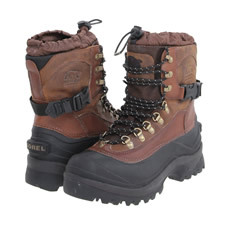 There are several styles of Sorel Boots available, with the rubber bottom style of boot being by far the most popular (and useful in my opinion). 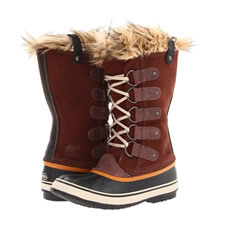 More Sorel Boots for Women - If you just want to browse the wide variety of winter boots from Sorel that haven't been reviewed in-depth here, you can view Sorel's entire collection over at Zappos. More Sorel Boots for Men - If you just want to browse the wide variety of winter boots from Sorel that haven't been reviewed in-depth here, you can view Sorel's entire collection over at Zappos. 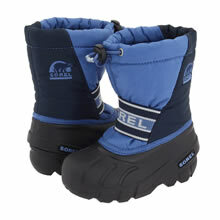 Sorel Boots for Kids -Sorel makes great winter boots for kids, being warm, durable and inexpensive. 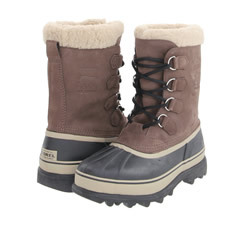 View the entire line of Sorel Kids collection over at Zappos. 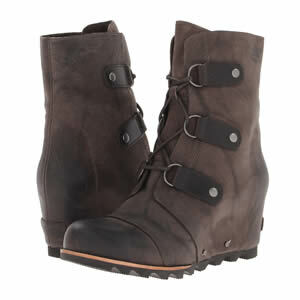 Most styles of Sorel boots are constructed with leather uppers and a lower bottom made of rubber. The importance of this rubber bottom cannot be understated if you spend considerable time outdoors in wet snow, wander through deep puddles or work in thick, wet mud. What makes the rubber bottom on Sorel boots special is that it is 100% waterproof, no exceptions (unless you somehow poke a hole in it). Moreover, the rubber bottom is especially easy to clean. If you have ever tried to clean caked on mud off leather boots, you know how difficult it can be to fully clean mud from leather. The rubber bottoms on Sorel boots avoid this problem entirely, as the mud slides right off the boot with a stream or water. Moreover, the rubber bottom will always stay dry. Leather that has been properly waterproofed will indeed prevent outside moisture from entering the boot. However, the leather will still get wet. And leather is not a fast drying material. 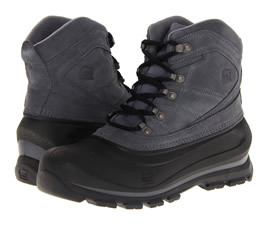 Because of this, if you spend much time in wet conditions on a day to day basis, Sorel boots with a rubber bottom are far superior to leather boots since they will be dry on a day to day basis, without any special effort being needed to dry them out (such as having to use a boot dryer overnight). 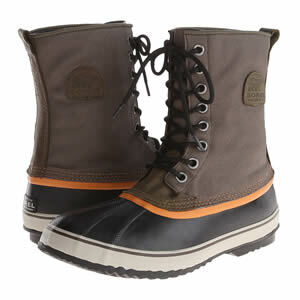 There is, however, one problem that buyers of rubber bottom Sorel boots need to be aware of. 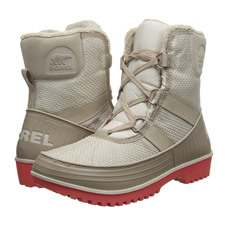 Unlike your typical gore-tex winter boot that uses Thinsulate insulation, which breathes, the rubber bottom found on Sorel boots does not breathe. What this means is that as your foot perspires, the water is trapped inside the boot. This is not good, since a wet foot equals a cold foot. Happily, there is a way to combat this problem. It is by using the proper sock combination. If you read the Importance of the Winter Sock article, you know what a terrible idea it is to wear cotton socks in winter boots, and this especially includes rubber bottom Sorel boots, too. To avoid the water on the foot problem, it is crucial to wear both a sock liner and a thick winter sock, especially if it is very cold. The sock liner will take water off the foot and transfer it to the sock. The sock then holds and absorbs the water. This keeps the foot dry, and a dry foot equals a warm foot in the winter months. A sock liner is not absolutely required if you plan on wearing Sorel’s in warmer weather. However, if you find yourself out in sub-zero weather for extended periods wearing a Sorel Caribou Boot (rated to -30), it is crucial to wear the sock liner if you want your feet to remain warm. Otherwise, your feet will soon become wet, followed soon thereafter by them becoming cold.